Jett Rehm’s temper tantrums had taken control of his family’s life. Several times a day, two-year-old Jett would fly into violent rages of crying, screaming and attempting to physically harm himself and others. The outbursts were almost always followed by periods of sorrow, where Jett would weep and feel guilty about his behavior. These behavioral health episodes occurred without provocation, making them difficult for Jett’s parents, Kerri and John, to predict. Behavioral health issues affect more than 20 million children in the U.S. – more than the number of children with cancer and diabetes combined. At least half of mental health disorders begin during childhood, and children with untreated behavioral health issues are at a higher risk for academic failure, substance use, criminal activity and suicide. These conditions also create stress and anxiety for parents, siblings and other family members. Jett at age three and a half. He began exhibiting symptoms of bipolar disorder at age two and was diagnosed at age four. The Division of Child and Adolescent Psychiatry at MassGeneral Hospital for Children (MGHfC) specializes in the early intervention and treatment of behavioral health issues. In addition to providing outpatient care, the division has clinicians embedded in pediatric clinics across MGHfC to provide mental health care for children dealing with medical conditions such as food allergies, diabetes and inflammatory bowel disease. The department’s work also extends to the bedside, where clinicians alleviate trauma and prevent anxiety and depression for children in the hospital. The goal of these efforts is to ensure a healthy future for children and their families. On the outside, Jett was a cherubic-looking preschooler, but internally he was tormented. Kerri and John, who own a real estate development and custom-building company on the South Shore, consulted with more than a dozen local pediatricians and psychiatrists. Some chalked up Jett’s frightening behavior to the “terrible twos.” Several blamed Kerri and John for dressing him in dark colors and spiking his blonde hair. Feeling intuitively that something more was going on inside their son, the couple turned to MGHfC. Over the course of eight months, specialists observed Jett’s behavior. They ruled out autism, food allergies and sensory issues as the causes of his frequent rages. “It was such a relief that somebody was finally listening to us and saying there might be something more going on,” Kerri recalls. At age 4, Jett was diagnosed with bipolar disorder, a severe behavioral health disorder that causes the inability to control mood states. People with bipolar disorder suffer from dramatic mood swings — often shifting rapidly from total elation to depression and melancholy. The condition can also cause sleeplessness, extreme irritability and aggressive outbursts. Kerri and John were relieved to finally have a diagnosis. It allowed them to look for a specialist. MGHfC clinicians connected them with Janet Wozniak, MD, director of the Pediatric Bipolar Disorder Clinical and Research Program. Dr. Wozniak is an internationally-recognized expert in the diagnosis and treatment of pediatric bipolar disorder. With her calm manner and ability to make both children and their parents feel heard, Dr. Wozniak has dedicated her career to advancing the understanding of bipolar disorder. Prior to Dr. Wozniak’s research, it was believed that bipolar disorder was a condition that occurred only in adults. Her work propelled further studies that showed that as many as two-thirds of adults being treated for bipolar at Mass General had experienced the start of their symptoms as children or adolescents. She also identified signs of bipolar disorder that are distinct to children, including more frequent episodes of irritability and aggression and fewer periods of wellness between these episodes. Dr. Wozniak is also at the forefront of studying treatments for pediatric bipolar disorder. Her research showed that antipsychotic medications often used to treat adults were the best first line of treatment for children. She is also working to find alternative, all-natural treatments for children dealing with side effects from prescription medications. Janet Wozniak, MD, has an annual check-in with Jett and his parents. Dr. Wozniak prescribed a medication known as risperidone. Within weeks, the medication began to reduce the severity of Jett’s episodes. Rages that would typically last up to three hours ended after 45 minutes. His parents found it easier to predict when the episodes would occur and to draw him out of them. 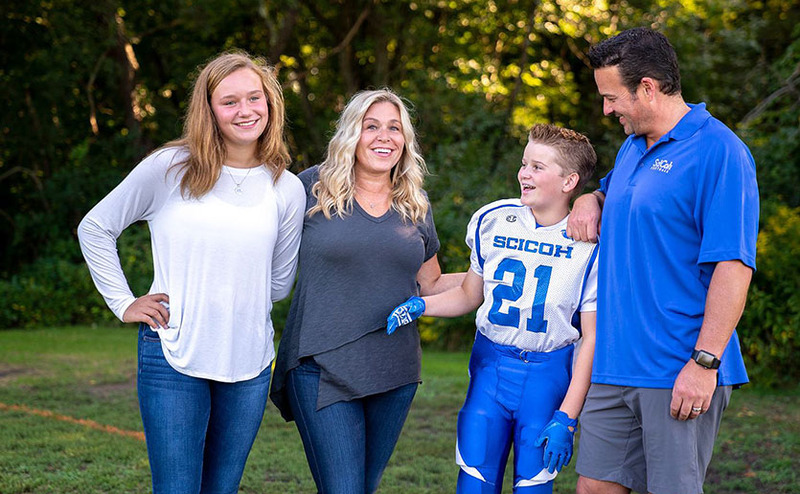 Jett’s newfound sense of control made it possible for the Rehm family to enjoy everyday activities like going to the supermarket or eating at a restaurant, activities that weren’t possible before. Six years later, 11-year-old Jett is still on the medication that Dr. Wozniak prescribed when he was in preschool. The combination of therapy and medication has enabled him to manage his bipolar disorder. He has friends, excels in school, and loves to play football. He plays wide receiver and middle linebacker, and his dad is a coach. The sport has become a positive outlet for Jett to channel his emotions. He also now recognizes situations that will trigger an episode. He recently decided against attending a field trip to Sturbridge Village, knowing that a long and loud bus ride would be overwhelming. To learn more about how you can support the Pediatric Bipolar Disorder Clinic and Research Program, please contact us.